Ride the free trolley, sponsored by Explore Asheville, throughout the district from 11am – 4:30pm. Most studios and galleries open 10am – 6 pm. Special evening events listed. 310 ART is celebrating the 10th Anniversary of their Fine Art Gallery. Featuring 19 artists, a special show of never before seen new large works will be on exhibit. Join us to meet the artists and see demonstrations of artists working in watercolor, oils, acrylics, bookbinding, wire wrapping and more! Enjoy Sips and Snacks. Art besties Lori Portka and Suzanne Armstrong first connected years ago when they discovered each other’s colorful, whimsical artwork. Who knew at the time that TODAY their studios would be across the hall from one another, on the 2nd Floor of Riverview Station in Asheville’s River Arts District! Their friendship and art are fueled with COLOR and JOY that is absolutely contagious- so they decided to celebrate it all and you are invited! Please come and join us for a curation of Colorful Art and Artwear to inspire, connect, and Spark Joy! Special Pricing and Refreshments All Day Long- JOY Guaranteed! Raku Saturday will take place at The Village Potters on Saturday, May 11. Qualified potters must register in advance to take part, but the public will be able to watch the Raku firing as it progresses. 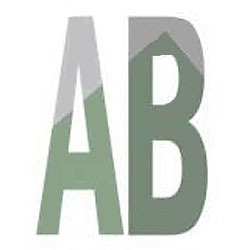 AVL Headshots is having an open studio day from noon to 4 pm! You can take a peek inside the the studio, observe a live photo shoot, and get your headshot taken for 50% OFF normal rates, at $100 for a 30 min session (includes 2 professionally retouched images). Your headshot images will be emailed to you that same evening. *First come first served, no appointment needed, but there may be a wait of 15-30 mins in between sessions. Cash or credit card accepted. Oil painting demonstrations. Going over different techniques and painting applications. Painting with watercolor and dark beer from local brewery. Framed postcard sized original souvenirs. The process of printmaking demystified! Come and see the process of creating multiple images through an assortment of creative techniques and the use of a printing press. Join Stephanie and Paul Jones in a celebration of the opening of their space at Victoria Pinney Gallery. There will be new art and photography and discussion of Paul’s pinhole process. Experience the creative energy of a live painting performance as Jonas Gerard amps up the music while allowing his subconscious to guide him to create art filled with light, color and warmth. The opening of “Wood/Glass” Exhibit showcasing work created collaboratively by many Asheville woodworkers and glassblowers. 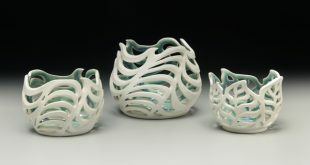 The gallery will feature blown glass vessels made utilizing wooden molds as well as unique glass and wood scupltures. Northlight Studios celebrates May’s second Saturday, with an invitation to art lovers to stop by and enjoy our creativity. Six artists with six different styles… we will be happy to see you. Our Moms are on our minds this weekend, and at Northlight Studios we make art to celebrate their inspiration and support. Thanks, Mom! 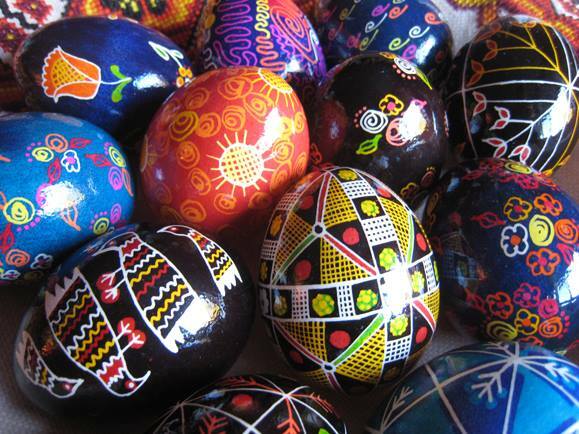 Pysanky – Ukrainian Easter egg – demos and cookies. See the ancient art of Ukrainian pysanky: layers of wax and dye, and then the wax is removed at the end to reveal the dazzling designs underneath! Ray Byram, featured artist reception. Demonstrations all day. Sips & snacks. Ray brings a distinctive style to large format landscapes painted in oil with palette knife. He also creates serigraphs based on original paintings using 16+ color separations. Stained Glass Weaving, random code generation and nervous system hacking. Deanna Chilian and Leslie Rowland will host a Q&A: An art buyers guide to finding the right painting. Callie Ferraro Ayers presents “Don’t Freak Out!” at Wedge Studios in the 2nd floor Spotlight Gallery. Ayer’s thought provoking series is a “Don’t Miss!” for the month of May. Pottery team of Mary Mikkelsen and Henry Pope, Anna Koloseike, and Tara Underwood. Come visit our two galleries and working studios and join us for snacks and live music. Enjoyable oil on canvas with Olga Dorenko. “The Mountaintop Experience” New works by Brit J. Oie. Exhibit and demonstration of mixed media collage and painting technique.